The convenient, freestanding Poopy Pouch Doggy Poo Unit waste station is the all-in-one solution to doggy waste. 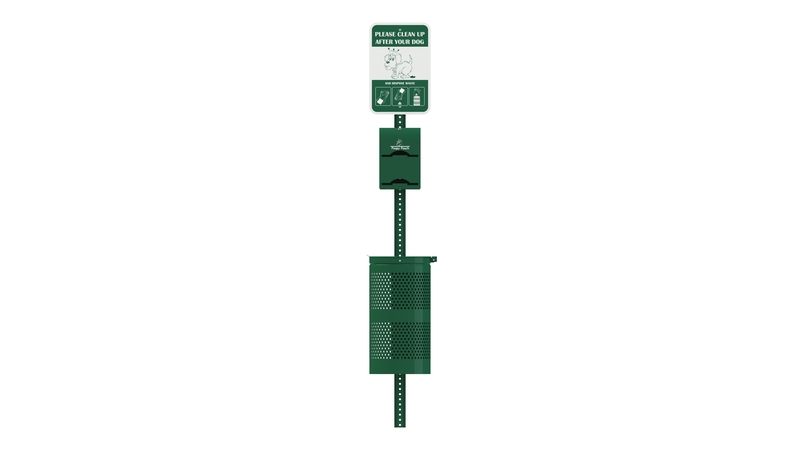 This handy unit includes everything you need to encourage pet owners to clean up after their pets, including: High Capacity locking galvanized steel powder coated dispenser in green gloss finish(Holds 2 Rolls of 400 bags), 8-foot steel channel post in Hunter green gloss finish (in two 4-foot sections), 10-gallon Powder coated steel waste receptacle with retainer bands, 9" x 12" aluminum sign: Clean Up After Your Pet, 800 Poopy Pouch Doggy Poo bags (2 rolls of 400 bags each), and Mounting hardware and instructions. *this item is not thermoplastic coated. **NOTE: The Federal Trade Commission (FTC), the nation's consumer protection agency, has raised concerns that when disposed of normally, the Poopy Pouch Doggy Poos Bags are no more degradeable than ordinary plastic bags, although they may be labeled as "oxodegradable", "biodegradable", "100% degradable" or "degradable". We have voluntarily agreed to stop making that claim.